Tout Mixed Archives | TOUT WARS! 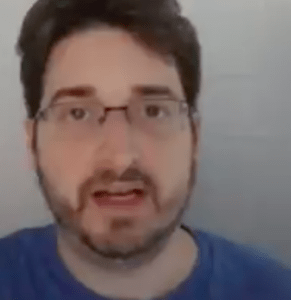 Tim Heaney Wins Tout Wars Mixed Auction in 2018! Tim Heaney is a Tout Wars champion. Tim won the season handily, topping perennial contender Fred Zinkie by 23 points. He took the lead in late May for good, made a few trades during the season, but the Draft Roster Standings suggest that his winning team was put together on auction day. His big draft day buys were Javier Baez ($6), Eddie Rosario ($3), Blake Snell and Miles Mikolas ($6 each). 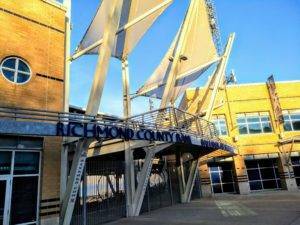 That left plenty of budget for extravagances like JD Martinez and Madison Bumgarner, and a championship. Tout Weekend is fast approaching. This year teams competing in the four Tout Wars auction leagues will need the luck of the Irish, as all four auctions are taking place on March 17. Yes, St. Patrick’s Day. The location is Richmond County Bank Ballpark, home of the Staten Island Yankees. In the home dressing and exercise rooms, particularly. Tout Wars Party: Friday March 16, 2018. 7pm at Foleys NY, at 18 West 33rd Street. Come one, come all. SiriusXM Fantasy Sports will be carrying live coverage of the four auctions, which can also be followed live on the auction spreadsheet (link to come), and Twitter (@toutwars). The event will be open to a limited number of guests. If you’re interested in attending, let a Tout know. Only people on the guest list will be admitted to the park. There will be food and drinks available for purchase by guests. Thanks to the Yankees for inviting us, and Andrea LaMont and Lenny Melnick for working out the details. His season started slowly. At the end of April he was in 11th place. But by the end of May he was in sixth, and in the week ending June 25th he’d climbed into first place. For good. While a team built on Corey Kluber and Buster Posey, Ken Giles and Jose Ramirez, has talent, the difference came with the breakout season of Robbie Ray, the freakishly good season of Chase Anderson, and the Dodgers callup of Cody Bellinger. In the end, Jeff won the league in his first season in Tout Wars Mixed Auction, and has finished first in both of his Tout Wars seasons (he won Tout Head 2 Head in 2016). 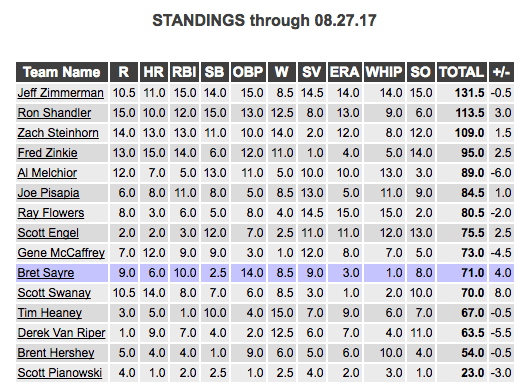 Jeff Zimmerman, last year’s Head to Head winner, has been in first place pretty much all season, and has a commanding lead. Who is winning Tout AL? Jeff Zimmerman is. But Zimmerman’s dominance came in the first half. 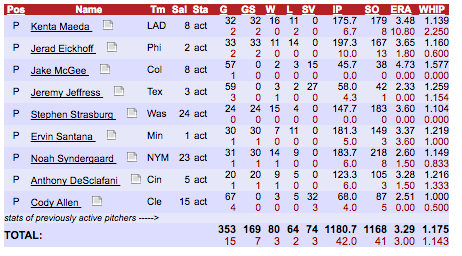 Since the All Star break Ron Shandler’s team has been a little better than Zimmerman’s. 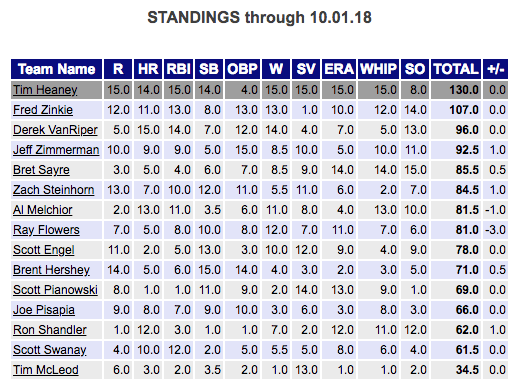 A quick survey of the current standings shows that if everything broke incredibly well for Shandler, he could potentially add 16 points, and would pass Zimmerman in a few categories. That would put him just a few points behind. It’s a long shot, for sure, but this isn’t over yet, at least not completely. See the league’s rosters and standings here. Jonathan Pierce Wins Doubt Wars Mixed Too! Jonathan Pierce won Doubt Wars NL, and he won Doubt Wars Mix, too, the first time a single player has won two Doubt leagues in the same year. Doubt Wars players put together dream rosters after the Tout Wars auctions are done, pricing players at $1 more than their Tout Wars price. 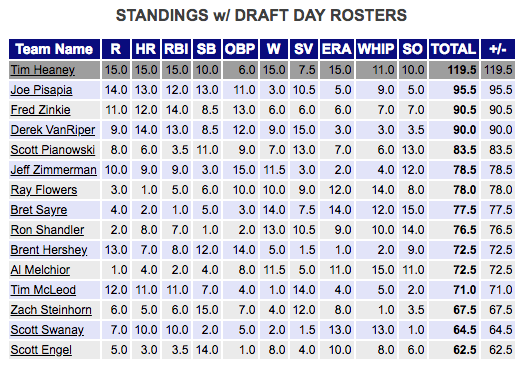 Draft day rosters are held all season long, and then combined with the Tout Wars draft day roster to form one big roto standings. The team with the highest average rank in the TW 5×5 categories is the champion. The highest Tout Wars finisher in Doubt was Scott Pianowski, who finished third overall. He finished sixth in Tout’s full season Mixed Auction league. 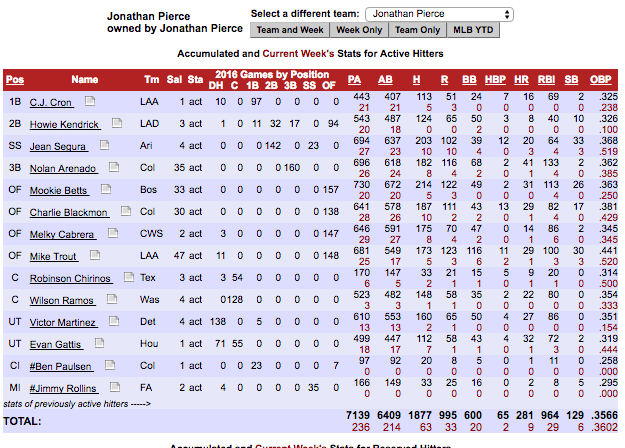 Pierce’s team had four 20/20 hitters and a solid rotation led by Noah Syndergaard, Kenta Maeda and Anthony DeSclafani. For a second time, congratulations Jonathan! Zach Steinhorn Wins Tout Wars Mixed Auction! 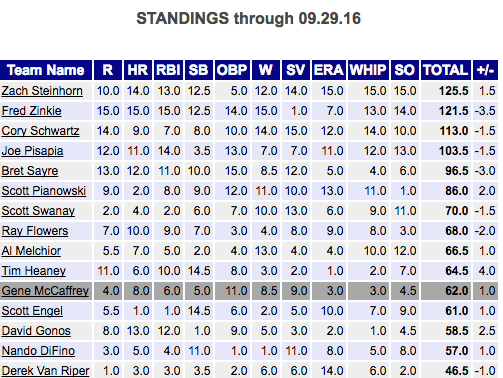 Zach Steinhorn wins his first Tout Wars title, topping multiple time winner Fred Zinkie in the final weeks. The key battle is in stolen bases, where Steinhorn caught up with Zinkie this week. The two are tied, with 142, two ahead of Nando DiFino and three ahead of Bret Sayre. 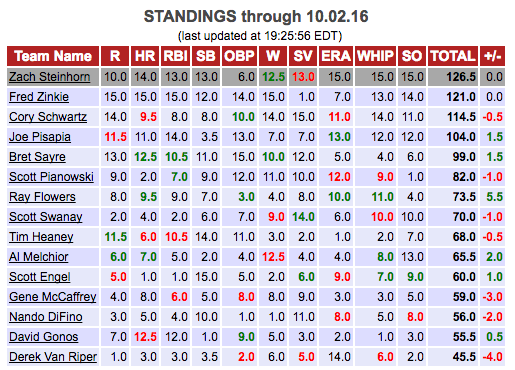 Another race in which they’re fighting for the same points is strikeouts, where Steinhorn is five ahead of Zinkie. 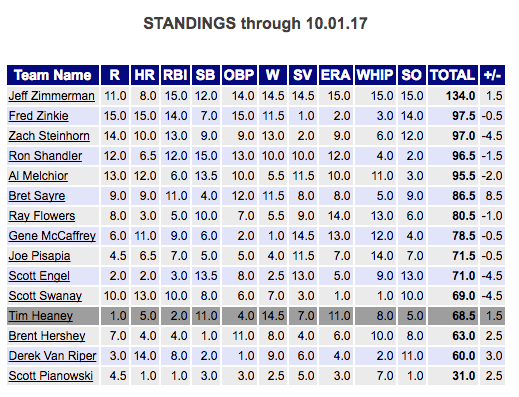 This might not be quite so close as it looks, since Steinhorn has eight starters this weekend, while Zinkie has only five. The rest of the board looks pretty set for Zinkie. He’s lost two points in ERA since this past Monday, but is .04 points behind Nando DiFino and .07 behind Ray Flowers in that category. Could he regain those? Sure, but it isn’t likely. The situation is much more fluid for Steinhorn, who could gain or lose one point in Runs, lose a point in RBI, gain a point in OBP, giving him a potential +2.5 and -3.5 in the hitting categories. Steinhorn is also two saves ahead of Scott Swanay, which perhaps leaves him vulnerable to the loss of a half point. He’s got one closer (Britton), while Swanay has three (Ramos, Melancon, Bailey). Zinkie has 121.5 points. If things go right he could end up with 124 points. Wrong? 119.